The communities that once surrounded the infamous Wild West town of Tombstone, including Dos Cabezas, Fairbank, Gleeson, Pearce, Courtland, Charleston, and Milltown, are now mostly ghosts of their former selves. These rich mining towns had promising futures when they were first established, but many experienced only fleeting boom times, like Courtland, a promising copper camp that survived only 12 years. During its short existence, the town of Charleston, founded in 1879 as a milling site for ore from Tombstone's silver mines, was every bit as wild and rowdy as its neighbor. There was corruption in the region too. Dos Cabezas's Mascot Mine became part one of the largest stock scandals of the time when it was exposed around 1900. 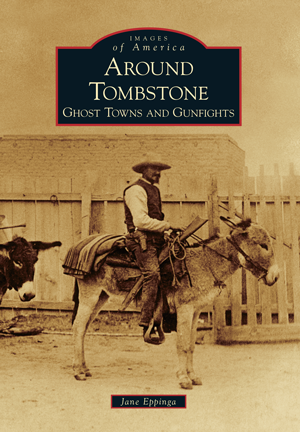 Today this fascinating, rough-and-tumble history lives on primarily in faded memories, crumbling remnants on the outskirts of Tombstone, and in vintage photographs gathered together in this volume. In this retrospective, award-winning historian Jane Eppinga reveals the unique history of the hard-rock mining towns and rowdy camps that once surrounded Tombstone. Eppinga is the author of previous Images of America volumes on Tombstone, Tucson, and Apache Junction, and here she presents more than 180 images culled from sources including the Rose Tree Museum, Arizona Historical Society, Arizona State University archives, Arizona State Archives, and private local collections.